In today’s flexible working environment, many organisations find that allowing their employees to work part or full-time from home offers tremendous productivity benefits. Keeping your remote users connected to your network is critical, but for those users working with protectively marked or commercially sensitive documents, the security risks of using public networks, such as the Internet or mobile telephone networks, are often too great to justify. 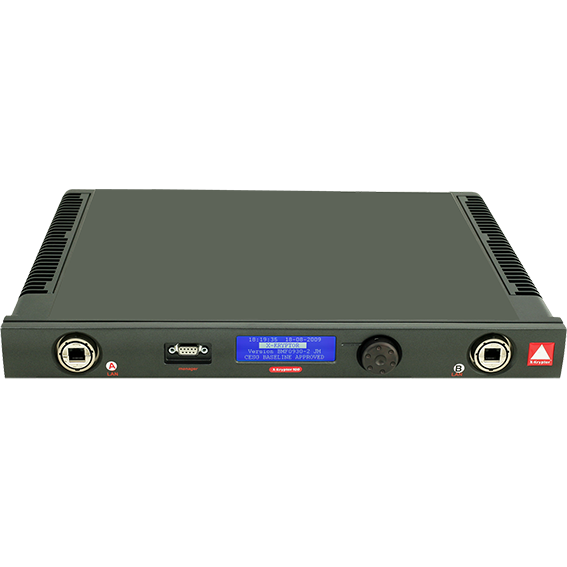 The X-Kryptor 25 is designed for deployment in medium scale remote access projects and site to site WAN encryption projects. Supporting 2000 AES encrypted tunnels the X-Kryptor 25 runs at 25 Mb/s. It uses the same operating environment as X-Kryptor 100 and provides the same high level of secuity protection. It is suitable for a 1U 19″ rack mounting. Approval for UK Military (MOD) use. With the speed and scalability to take full advantage of your bandwidth, X-Kryptor 100 runs at over 100 Mb/s at full duplex and supports up to 5000 AES encrypted tunnel connections. This system is designed for large remote access user communities and for protecting data traversing modern third party owned WAN links. It is suitable for a 1U 19″ rack mounting. X-Kryptor 100 has undergone independent security evaluation by the UK’s national technical authority for information Assurance – CESG – and is able to protect networks carrying RESTRICTED information. X-Kryptor Lite is a secure VPN Gateway designed for use in SOHO networks that nevertheless require high standards of information assurance. The X-Kryptor Lite supports up to 25 devices on its restricted interface and communicates at 11 Mb/s. It has a compact form factor to take up minimal space and runs silently with a low power consumption and heat emission. X-Kryptor Lite has undergone independent security evaluation by the UK’s national technical authority for information Assurance – CESG – and is able to protect networks carrying RESTRICTED information.